The September/October issue is out! I didn't know this delightful magazine existed until Penni @ Comforts of Home recently highlighted it -- her recipe Potato Cheddar Corn Chowder won the contest to be featured in this issue. Congrats to you, Penni! I splurged and just bought my online copy -- it's available to buy as a digital, tablet or print copy. The video above gives a nice overview. Oh my....it's lovely! 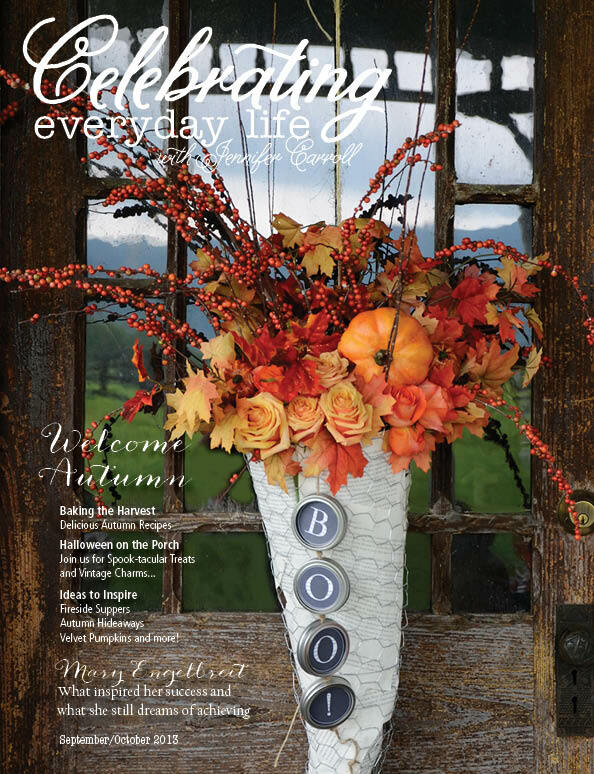 Lots of gorgeous photography, and it's filled with all manner of wonderful ways to celebrate the upcoming season. Plus, I'm excited to see an interview with Mary Englebreit, as she's one of my all-time favourite artists and designers. On that note, check it out and enjoy the rest of your day! Hi Brenda! Oh - I now have a longer list of books I want to read - especially the new Susan Branch book - my husband (who works at Barnes & Noble) needs to hear about that! Oh! You read my post about "that poor girl" - and I guess Canadian news didn't make as big a fuss over it as our debauched media did here. Apparently, Miley Cyrus of Hannah Montana fame, performed a beyond raunchy number at the MTV awards this week and it was the top news story. Yes - way over-exposed. I have always hated how they exploit children and try to turn them into "role models" - their end is always the same these days. Tragic - and how many little girls now are curious about all the wrong things! If you'll google it, I'm sure you'll read a plethora of stories on the subject. For me - I'm with you - celebrating goodness, innocence, and beauty! I have my Victoria Magazine, too, and yet have had time to soak it in. My birthday is Sunday - perhaps that Susan Branch book will come my way if I drop a hint to hubby - he gets a generous discount! And, know - I have not forgotten your letter. It is sitting out waiting for my leisure time to take it up and joy in handwritten sentiments to a kindred spirit pen pal - blog pal - whatever . . . sister in Christ! Ah Brenda - this looks like a wonderful magazine. I love Victoria and now I may have to add this one to my list. Thanks for sharing and have a beautiful day. Oh, I love Mary Engelbreigt, too! I have all kinds of her mugs, a teapot, serving tray, etc. Thanks for sharing this lovliness! I have never heard of this magazine. It looks charming - on my way to check it out . . .